The LastPass Blog: 70% of Us Forgot Passwords in the Last Month. Will You Help Us Stop the Madness? It pains us at LastPass to see this statistic. Yes, 70% of us forgot a password in the past month, according to a recent survey by Symantec that polled 1,028 adults in the last month. On top of forgetting a password, 40% of those surveyed also admitted that remembering their passwords is one of the most difficult challenges of their daily life - more stressful than balancing their checkbook! It's true, managing a growing amount of data has become an inconvenient reality of modern life. We live in a world where technology is becoming more and more integrated into all aspects of our everyday lives. Which means we use an ever-increasing number of online accounts, apps, and services, all of which require usernames and details for us to keep track of. We also need our data in more places than ever - on our computers at home and at work, on our smartphones and tablets. Keeping default logins, such as "admin" and "password", enabled on our systems. Even with bad password management practices, though, we're still forgetting our logins. We're wasting time resetting our passwords, and we're dealing with the inconvenience of constantly trying to keep track of all of our data. So it's clear things need to change. It's clear that we need strong passwords, and we need unique passwords for each of our accounts. But we need a way to keep track of those passwords, without taxing our brains or adding more stress to our lives. And we need that data to be accessible wherever we are - at home, at work, on our mobile devices. We need a solution that makes all of the above possible. And that solution is: LastPass. And of course, LastPass users are already aware of how LastPass simplifies your digital life and helps you follow best password management practices while still making it easier to manage all of your data. But there's a whole population of Internet users out there who are still doing things the hard way, who deserve to know that there's an easier, more secure way! We challenge you, LastPass users, to help us stop the password madness. 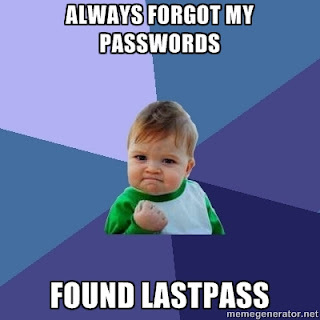 The next time someone tells you they forgot a password, ask them if they'd consider a password manager like LastPass. Explain how password managers work, and how LastPass simplifies your digital life and improves your online security. What motivated you to start using a password manager, and how did you make your selection? Do you have a story about using LastPass that would be motivating to others? If so, send it along to press[at]lastpass[dot]com. Help us #bethepasswordchange today for a more secure tomorrow.